The FloodProof ™ Automatic Door Sealing System has unique Smart Sensors that activate upon detection of rising flood water. An amazing range of Automatic Inflatable Seal Flood Doors, Compression doors and Barriers for Home, Business, Store, Commercial Property,even Historic and Listed buildings. Over 5 million properties are at risk of serious damage, caused by major flood events here in the United Kingdom. Many buildings still have no protection. Flash floods are forecast to get worse and more frequent in the future, in other words make sure your property is fully protected from the ingress and deluge of water. For instance our automated solution that is totally self-starting and is a quiet robotic system offering your building 24/7 365 days defence against the threat of flood water. So If you are aware you are in a high-risk area and you are located in the UK, Scotland, Northern Ireland, Wales, Republic of Ireland, England, Isle of Wight, Isle Of Man, Channel Islands. No Problem We Can Help You! We all know the weather conditions can be unstable, unrelenting and the weather does not discriminate. Moreover those that have already been flooded will tell you about the misery that flooding causes, being homeless for periods of 12 months or more, loss of valuable and irreplaceable items, furniture and electrical goods ruined, vehicles and major damage to your home. For business major damage to your property, stock, machinery, equipment and also to your the cash flow. These downpour and deluge rain conditions are forecast to get worse and more frequent. Within the industry there are inefficient structures that don’t offer a suitable barrier against the ingress of rising water levels. But however our range of automated passive products combined with the latest technological developments in flood defence, gives you a hand off fully automated receptive solution for your property. Above all, no need to worry when your away from your home or business premises. Our unique self-starting automatic door sealing system quietly works for you to buffer the surge of water and has the strength to offer defence and security from flooding 24/7 365 days a year. technology that’s incorporated into our self-starting robotic flood defence systems that will safeguard your home or business. With over 25 years of experience in the flood defence industry, our professional team will deliver the skills necessary giving you a potentially life saving service for a property. WE OFFER YOU THE MOST EFFECTIVE AND PRACTICAL SOLUTIONS FOR YOUR PROTECTION. 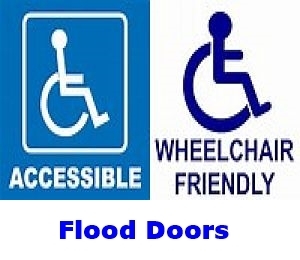 An important part of our business is fitting flood protection doors for disabled access, and our disabled customers can choose from the widest range of flood doors on the market today. GET YOUR FREE SURVEY & DEMONSTRATION on guards, doors, barriers, gates, protection for garage doors, protection for roller shutter doors and a wide range of additional flooding protection products giving you the best defences against flooding. We both supply and install all our products, which are rated as the most advanced available, to offer you the most complete service on the market and WE GUARANTEE TO BEAT ANY LIKE FOR LIKE QUOTATION ! your home or business protected by automatic flood resilient doors, emergency Doors. Our range of residential flood protection doors go into the hundreds of choices we are now the only company that offer you the opportunity to design your own door/s with our door designer. We offer the largest choice of flood protection doors available on the market. DESIGN YOUR OWN RESIDENTIAL FLOOD DOORS WITH OUR ONLINE DESIGNER.